719 universities from 81 countries were assessed in the Universitas Indonesia League Table, which highlights sustainability and environmental management at universities around the globe. Bangor University retains its eighth position globally for the second year and is placed 7th in Europe according to the rankings which measure six indicator areas at each university. 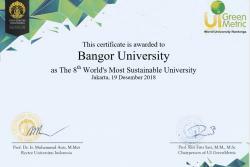 Bangor University achieved the full marks available for education - reflecting the University’s commitment to sustainability education and research. 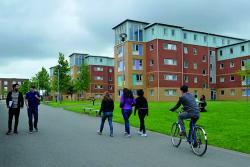 The University’s green open spaces and emphasis on pedestrians also gain a high percentage of the available points, while the university’s focus on reducing waste and recycling is also beneficial and ranks highly, as does energy and climate change through smart and green buildings and energy efficiency. Sustainability highlights on campus in the last year reflect the University’s ongoing commitment to taking positive action in promoting sustainability and achieving environmental improvement. Events included the second campus wide Waste Awareness Week, the Sustainability Carnival, a Climathon Challenge and the regular Sustainability Think Tanks held throughout the year to enable staff and students to share ideas and interests. “This is a campus-wide team effort. Driving environmental improvements and resource efficiencies throughout the organisation is a challenge without end and one that requires all of us to join in. We recognise that sound environmental management is essential to our aim of developing and applying innovative ways of integrating consideration for sustainability and the well-being of future generations into everything we do, through our research, our teaching and our own supply chain”.